This (very nearly) fat free (and gluten and soy free) vegan meal started out by piecing leftovers together. I never would have thought to blog about it, except for the fact that I shared it with my dear friend Clark in the middle of a hectic day of moving, not sure he would like a concoction I usually make when no one is around. His eyes got wide when he tasted it. “Did you put this on the blog?” he asked. When I said no, I thought it was leftovers, he said, “You really should put this on the blog. It’s really good.” And thus yet another “recipe” got hatched from a leftover afterthought. Although this meal doesn’t have any Northwest Native American foods in it, it reminds me of the energy of a totem pole. Instead of protective animal spirits carved into wood, the spirits of 3 different Asian staples were “built” into a single tasty meal to fortify and protect vegan well-being. In keeping with the spirit of this blog, “slow motion” might be one of its totems, since you have to make a couple of comfort staples first, but they are easy and relative fuss free to cook up. “Fusion” might be another of its totems, because it combines flavors and foods used in at least 3 Asian cuisines. And to show its playful way of combining everything harmoniously, it has a line-up of tasty-colorful veggies and even one fruit to complete its cast of helpers. Come to think of it, that’s powerful medicine, no matter what your tradition is. When your nutritional totems are crowned with “tasty-colorful,” how can you not be protected, guaranteed to meet the world, or the dinner or lunch plate, with arms (and mouths) wide open? 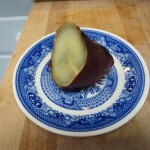 First, bake a Japanese sweet potato. It’s easy. Preheat the oven to 425. Prick the potato (or potatoes) with a knife in several spots. Line a shallow pan or cookie sheet with baking parchment to catch the sugars as the potato bakes. Bake for an hour. Let cool. Store in the fridge until you are ready to dice some of it up for this meal. Second, make some kitchari. Kitchari is India-Indian style comfort food, a type of porridge usually made with lentils (dal) and rice. It is ubiquitous in Asian cultures. The Chinese version is called congee in English. I read in my falling-apart copy of World of the East Vegetarian Cooking that “rice porridge, eaten from Japan to Persia as breakfasts, snacks and lunches, are considered warming and soothing, as well as a stabilizing influence on the stomach and digestive tract.” An online Yoga Journal article has a similar take. Often these porridges are prepared with coconut, or ghee (clarified butter), or spices tempered in ghee or oil may be stirred in, but we won’t do that here. The only high fat food will be the small amount of peanut butter whipped into in an optional topping. 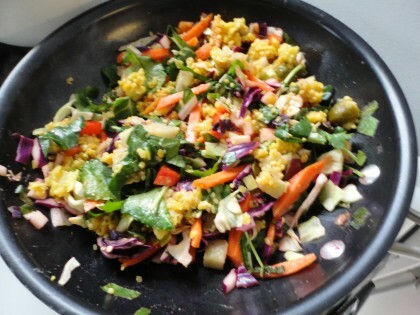 For this recipe, you want to make an updated fusion style version that uses “new world” quinoa, power food of the Ancient Incas, and “old world” red lentils, power food from the Middle East and North Africa. The recipe I make is a version of one from The 30 Minute Vegan as featured on this Everyday Dish TV you tube video. My standard veggies along with the garlic and onion listed in the video have become Brussels sprouts (frozen ones work great) and carrots cut into matchsticks. I also add a bit of turmeric and ground feneel or asefedtida to the pot. Instead of water or vegan buillion cubes, I use my Everything But the Kitchen Sink broth. The ratio of water to the quinoa and red lentils is 3 to 2. So for 1 ½ cups each of quinoa and red lentils, 5 cups of broth or water. You can lightly toast the quinoa in the warm pot first if you like. Now that you have these two staples on hand, you are ready to make your Tasty Colorful Kitchari skillet meal. 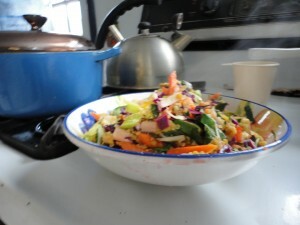 optional, but good: a teaspoon of my version of Happy Herbivore’s Cheater Pad Thai Sauce. 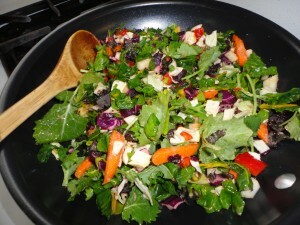 Toss it all up in the bowl with the veggies and apple as your non-stick skillet heats on medium. Take your sweet potato out of the fridge and slice off a couple of healthy sized round slices. Dice these up and reserve. Add the veggies and apple (but not the sweet potato just yet) to the hot skillet and stir fry a couple of minutes until they turn even brighter colors. Then add the cooked Japanese Sweet potato and a big dollop of kitchari to the skillet. Stir fry until everything is warm and blended. Put in your favorite bowl. Top with any or all of the following: freshly grated ginger (highly recommended), an extra swig of your favorite hot sauce , a few dots of extra Cheater Pad Thai Sauce, chopped cilantro or parsley, diced green onions. I never measure how much of any of the ingredients I put into the skillet. I just eyeball and add more if I’m feeding another person. Maybe you’ll simply want to try out the kitchari first, and add your dark green veggies at the end, like the video suggests. But then you’ll have leftovers. 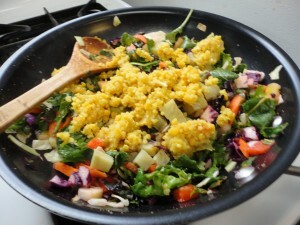 And you can make a rainbow totem colorful-tasty kitchari skillet meal, with or without the Japanese Sweet Potato. It’s all good. And all good for you. This looks delicious, and since I already own The 30 Minute Vegan, I’ll definitely be making it! Thanks, veggiequest, awesome! I was over at your blog visiting yesterday, and really enjoyed it. The butternut squash and the carrots with onion and rosemary really sounded good to me. WOW! Thanks for the beautiful post! Funny, I’ve been looking for a recipe to use some Japanese sweet potatoes and here you are, perfect! How lucky we are to have you on our list of must read blogs, thanks Moonwatcher! You are so welcome, Marcia. I’m always glad to help someone eat a Japanese sweet potato! Not only does it sound delicious it is so beautiful! Can’t wait to try it!! I so enjoy your posts…they are like your food…full of color and inspiration! Thanks so much for sharing your stories! You are so welcome, Lisa! I am so glad you enjoy my posts! This looks fantastic. I suppose it could be made with brown rice, too. I have oodles of brown rice and no quioa at the moment. But maybe I’ll buy a little box and give it a try just the way you suggest. 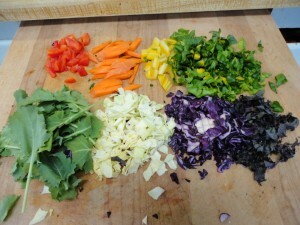 I like that you add your veggies as a stirfry at the end. Gotta love fresh, tender-crisp veggies. Hi Ginger, thanks! If you have a lot of brown rice, then you could try making some kitchari with it and a lentil that cooks about the same length of time as the rice–like yellow split peas for instance. The quinoa and red lentils go together nicely becasue they cook in about the same amount of time. And yes I love those fresh, tender-crisp veggies!! This is so-o-o-o-o wonderful. I was daunted at first by the number of steps, but it is really easy to do … just do one thing at a time. The nice part is that you’re not under pressure to get any one step done in a specific time. This recipe goes at your pace. And so-o-o-o-o delicious. My husband and I have literally been eating this every dinner for the past five nights. 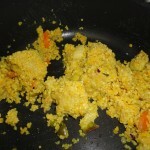 Yesterday evening I asked him what he wanted me to cook … and it was still Kitchari Skillet. Thank you very much for posting this recipe. BTW. I make the Cheater Pad Thai sauce using peanut flour rather than peanut butter. Peanut flour is what’s left after pressing peanuts to extract the peanut oil, so it is mostly fat free. I get it from http://www.bellplantation.com where they call it PB2. I use it pretty much whenever a recipe calls for peanut butter. Guilt free and yummy. Dear Kathleen, I can’t tell you how broadly I smiled to read this comment! How you grasped the “just do one thing at a time” without any “pressure-to-get-any-done-in-a-specific-time” spirit of the recipe, as well as enjoying the great tastes!! I am really glad to know you and your husband enjoyed it so much. Thanks, too, for the tip about the peanut butter flour. I’ve heard of it, just haven’t gotten around to trying it, but someday I will. The amount of peanut butter I use is miniscule. I keep it around for the dog 🙂 , and am not tempted to eat a lot of it. Hi Carol, thanks for stopping by! I hope to spend a little time this weekend exploring some of the wonderful ideas on your post!